I have written often in the past about Judge Anthony Alaimo, a United States District Judge for the Southern District of Georgia, who the Georgia Trial Lawyers Association honored with its first Anthony Alaimo Guardian of Justice Award last year. 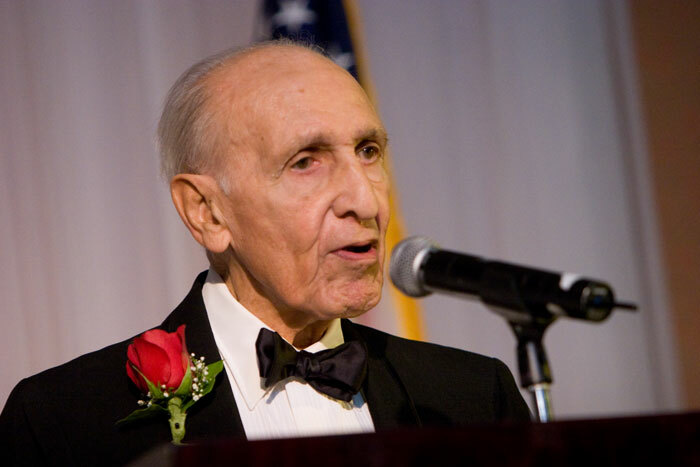 Judge Alaimo passed at the end of 2009. Put simply, there will never be another person like him. Below is a column that appeared in the Augusta Chronicle about this Great American. U.S. District Court Judge Anthony Alaimo wasn’t some judge who delivered generic up-or-down decisions from an unfeeling bench. He helped shape the very culture of the legal profession and the judiciary in Georgia. If you heard the man’s life described, you almost would think you were hearing the plot of a movie. In a way, you would – more about that in a bit. How powerful is Alaimo’s legacy? When the Georgia Trial Lawyers Association created its Award for Judicial Excellence in 2008, it not only gave the very first award to Alaimo, they named the award in his honor. Alaimo came to America as a toddler in 1922 with his Sicilian immigrant parents, and in Jamestown, N.Y., he grew into a young man who embraced hard work and solid moral values. He cut hair and shined shoes to help put himself through college. And like many patriotic young men of the Greatest Generation, he served his country in World War II, as a B-26 bomber pilot. We mentioned a movie plot before. Alaimo was the only member of his flight crew to survive when his plane was shot down in 1943. While imprisoned by the Germans, he helped fellow prisoners tunnel to freedom in a daring breakout that was immortalized in the 1963 film The Great Escape. He engineered his own great escape from another prison camp in 1945. After graduating from Emory University with a law degree in 1948, he practiced with distinction in Atlanta and Brunswick. But it wasn’t until after he was confirmed for the federal bench in 1971 that he began striking his greatest blows for fairness and equality. Perhaps his best-known decision was in the historic 1972 Guthrie v. Evans case, which spurred sweeping prison reforms, starting with the then-notoriously corrupt, rat-infested, sewage-swamped Georgia State Prison at Reidsville. His decisions dramatically improved the security, safety and basic privileges of prisoners. Closer to Augusta was the landmark Rogers v. Lodge case in 1982, which confronted election procedures that Alaimo found were unfairly diluting minority voting strength in Burke County – a decision reaffirmed by the U.S. Supreme Court. He served as the Southern District of Georgia’s chief federal judge from 1976 to 1990, assuming senior judge status the following year. And through it all, he set a pace and a tone in the legal community that stressed decorum, respect and, above all, justice. Augusta attorney David Hudson counts himself among the fortunate who began practicing in front of Alaimo. Sadly, the “Alaimo way” can no longer be witnessed firsthand, only hopefully emulated by others. This fine judge truly will be missed.